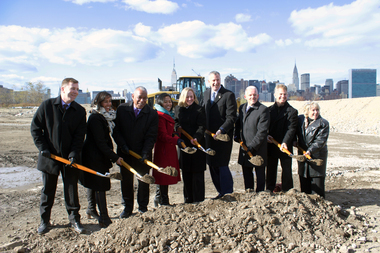 LONG ISLAND CITY — Mayor Bill de Blasio and other city officials broke ground Monday on the next phase of affordable housing at Hunters Point South — in what he promised will be an "important step" in addressing the city's affordability crisis. The second, $99 million phase of construction will include building infrastructure like sewers, roads and sidewalks — as well as an expanded Hunters Point South park — on a portion of formerly industrial land south of 54th Avenue, next to the East River and Newtown Creek. The infrastructure work, to finish in 2018, will make way for the construction of another 3,000 apartments in the waterfront neighborhood. More than half of the units will be set aside for low-, middle- and moderate-income residents, officials said. "People of all walks of life, people of all different incomes — you'll see a lot of people living here who are the backbone of the city, the teachers, the nurses, the first responders who we depend on every day who need an affordable place to live," de Blasio said. In addition to housing, the second phase of the project will include 100,000 square feet of retail and community space, as well as an expansion to Hunters Point South Park that's expected to include a kayak launch and an elevated platform overlooking the East River. When finished, Hunters Point South will include approximately 5,000 new apartments — more than 60 percent of them affordable — creating what officials say is the largest new housing project built in the city since the 1970s. "This is how we actually change people's lives by creating more housing, and particularly by creating a lot more affordable housing," the mayor said. The first two buildings of Hunters Point South opened this spring and summer with 924 affordable apartments, where rents for low-income tenants started at $494 a month for a one-person studio, while the same for a moderate-income tenant started at $1,561 a month. Developer TF Cornerstone has been tapped to build two more buildings with nearly 2,000 apartments between them as part of the first phase of the project.